Details: The Rheostatics, live at the Legendary Horseshoe Tavern in Toronto, December 14, 2005. On this night the Rheostatics were made up of 7 people, the usual suspects, plus Ford Pier on Keys, legendary pedal steel player Lewis Melville, and what Whale Music would be complete without Dave Clark. For those keeping track thats 2 drummers in the band for this show! There were a few other guests as well, Brother Rick on "Guns" and Tannis Slimmon on "Palomar". At the end of "Legal Age Life" Dave C got up from the drums and pulled a slide whistle out of his pocket and proceeded to solo on it, Martin, not one to be shown up, ran off stage and grabbed a flute and came back to duel with Dave. On Claire some of the band switched things up, Tim, Dave C, Lewis,and Martin kept to their normal rolls but Dave B played Drums, Mike played tambourine and Ford played bass. Dave Clark's mic wasn't working until "The Headless One". Edmund Fitzgerald was played in complete darkness for most of the song which added a nice ambiance, towards the end blue lights were turned on. And if that wasn't a great way to end the show they played an fiery rendition of Horses. 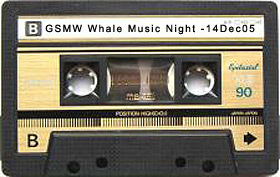 This was the 7th show of their 10 night Fall Nationals run at the Horseshoe and the band performed Whale Music in full. 8 track files provided by Steve Clarkson - mixed by Darrin Cappe with a bit of track specific compression, gain, limiting and slight reverb to drum and vocal tracks.